Ukrainian President Viktor Yanukovich has demonstrated he is in the class with really war criminals. He is prepared to kill as many people as it takes to retain power. He stole the presidential elections by corruption and the people protesting in Kiev are predominantly coming from the West near Poland. The situation is demonstrating the Civil War is now likely as Yanukovich’s the opponents declared political autonomy in the major western city of Lviv on Wednesday after a night of violence when protesters seized public buildings and forced police to surrender. It is not just Lviv, but the entire region. Yanukovich fired the head of the Army and appointed the head of the Navy demanding blood. He is also trying to block all roads to prevent the people from the West to enter Kiev. Yanukovich has proven to be ruthless and this is a good example how those in power see it as their divine right rather than serving the people. Ukraine is splitting along a historic cultural and linguistic faultline with the regional assembly in Lviv, a bastion of Ukrainian nationalism near the Polish border, condemning Yanukovich’s government for its “open warfare” on demonstrators in Kiev and saying it took executive power locally for itself. Yanukovich will not allow the West to leave and here is the crisis in fast motion. Additional cities have joined such as Khmelnitsky, Ivano-Frankivsk, Uzhorod and Ternopil, also took over public buildings. Yanukovich’s government has lost central control for he also lacks the confidence of the people in the West after stealing the elections and the rising sentiment that he is not a representative of Ukraine. Lviv, is an ancient city of 750,000 and capital of a region of 2.5 million people. Yanukovich’s ruthless character and his off-the-cuff referring to these people as “cattle” that is nearly 500 km (300 miles) to the east of Kiev will go down in history as really stupid. Government NEVER has the right to wage war against its own citizens. This is NOT a monarchy. Yanukovich’s administration in Lviv was forced to surrender making officers come out with their hands up. This entire revolution is rooted in corruption that people are simply getting fed up with on a global scale. It will most likely start to emerge in the USA after 2015.75. You cannot simply oppress the people forever and treat them as economic slaves. This is the stuff that lies behind most revolutions. There are those from Eastern Ukraine who have written taking the Russian position. I believe in freedom regardless of the government involved. Turn the economy down and you will see the same thing rise to the surface in the USA for the economic corruption is pervasive. Ukraine should split allowing the West to leave and the East should join Russia in a peaceful divorce. Forcing the other side to accept the decrees of their opponents will NEVER work and history stands as witness to that. If Ukraine wants peace, separate along the language fault-line and each live the lives they desire. We will see the same trend rise in the USA between the religious right and with its Tea Party and the Democrats with two extreme different philosophies. At the core lies the difference between freedom and authoritative Marxist control that deems the people are economic slaves to be exploited. These philosophies are at the core of all of these uprising over corruption. This clash between left and right in Ukraine is the tip of the iceberg and it presents a very serious danger to the entire world. This issue goes far beyond just Ukraine and its 46 million people who are now trapped in a geopolitical tug-of-war between Russia and the West that will fill the headlines. This uprising began over corruption. Russia wants to blame the West instead of accepting the fact that it is corruption and economic suppression. No government will EVER admit they are the root problem and that will be the case with the USA after 2015.75. 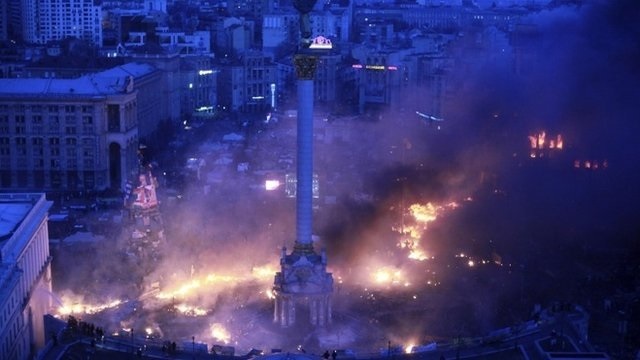 This Ukraine crisis is escalating into a danger of international war for the next 6 years.